Birds, fish, crustaceans, turtles, and more—every inch of Pensacola Beach is teeming with life. When you look across the white sand, it may appear to be lifeless, but there are many different invertebrates that live beneath the sand — ghost crabs, coquina clams, and the mole crab (sand flea) are a few that can be found buried near the shore's edge. The luckiest of visitors might get to see a sea turtle crawl onto the shore to nest. Turtles have been known to have their nesting paths blocked by chairs and umbrellas, get tangled in fishing lines, or become disoriented by lights. Turtles typically nest at night, so do your best to keep the beach clear of debris in the evenings. Even now, there is life all around you. Do your best to respect it. Above all, please remember to throw away your garbage, and do not feed the birds or other wildlife. If we all do our part, we can continue to share our shores with wildlife for years to come. Use walkovers instead of walking across the sensitive dunes — this will help reduce erosion. Reduce, reuse and recycle the things you take to the beach — don't leave them there. Throw away your trash — use public trash containers at the beach or take it home with you. Cut the rings off plastic six-pack holders so that animals (like fish, turtles, or seals) can't get tangled in them — leave no solid plastic loops. Join local beach clean ups. Dispose of boat sewage in onshore sanitary facilities instead of dumping it into the water. Don't disturb wildlife and plants — this is their home. Welcome to the Pensacola Beach Eco Trail! On the trail, you'll learn about local plant and animal life including dolphins, turtles, sharks, birds, flowers, and fish. Informative, educational signs have been posted at key locations across the beach, each one exploring a different ecological topic. Many signs feature Quick Response (QR) codes that you can scan with a mobile device to access more information online. You'll learn the secrets of Pensacola Beach's white sand, discover the dangerous journeys of sea turtles, identify mysterious seashells, and so much more. Click here to view a larger version of the Eco Trail map. 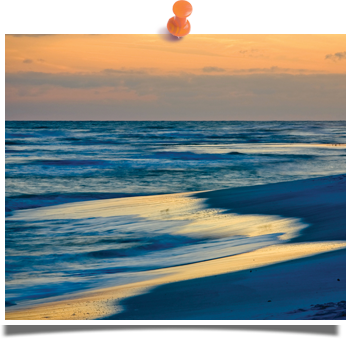 Earn a Pensacola Beach Eco Trail Souvenir! Protecting beaches isn't just something you do at the beach. In fact, some of the most important things you can do are at home. Regularly maintain your septic system, if you have one. Use natural substances like compost to fertilize gardens and lawns. If you must use fertilizers or pesticides, read the label and use as little as possible. Throw trash in proper containers; don't leave it on the ground because it can be swept up by runoff and carried to the beach. Don't throw motor oil in storm drains; recycle it at your local service shop.